Download a blank fillable Dd Form 1172-2 - Application For Identification Card/deers Enrollment in PDF format just by clicking the "DOWNLOAD PDF" button. Complete Dd Form 1172-2 - Application For Identification Card/deers Enrollment with your personal data - all interactive fields are highlighted in places where you should type, access drop-down lists or select multiple-choice options. 3. SSN OR DOD ID NO. I certify the information provided in connection with the eligibility requirements of this form is true and accurate to the best of my knowledge. identification card in the performance of their duties with the Uniformed Services. 44. SSN OR DOD ID NO. 56. SSN OR DOD ID NO. Receipt of new card is acknowledged. 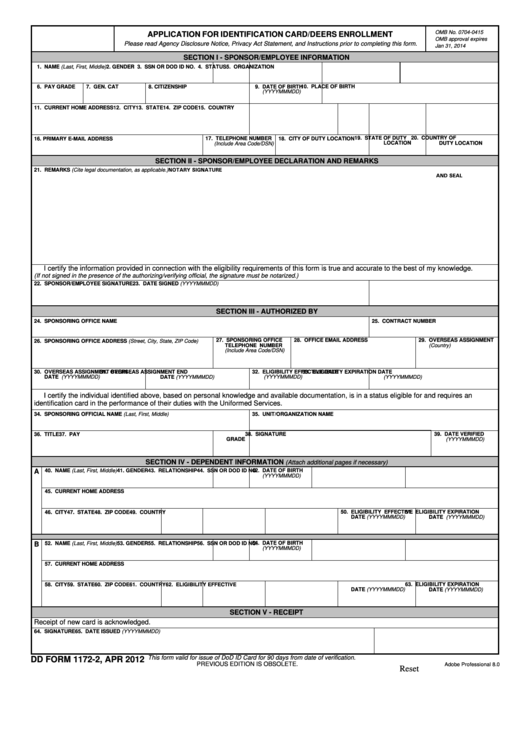 This form valid for issue of DoD ID Card for 90 days from date of verification.